We've had @iMore set up on App.net for a while now but this week we flipped the switch to start posting our stories there. We're using IFTTT.com to handle the posts, and it's not a great solution. Basically it checks the iMore RSS from Twitter and then copies that over to ADN. Unfortunately that includes @replies, which I'd rather it didn't. That's part of the reason we waited -- hoping that something better would come along, like the twitterfeed.com service we use for Twitter, but nothing seems to have so far. We could have kept waiting, but because two major barriers to entry dropped last week, and APN picked up steadily, it made sense to start now. We had readers there, they wanted to get iMore content there, it's our job to provide it. 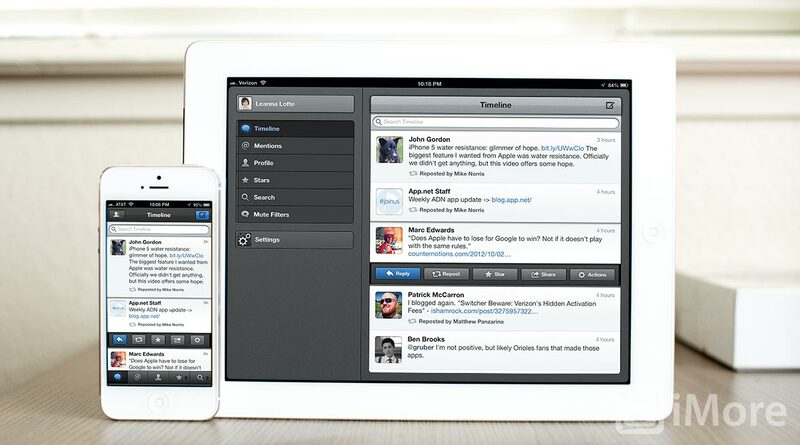 We won't be abandoning @iMore on Twitter, of course. ADN is still mostly by geeks for geeks, and Twitter is still home to most of our mainstream readership. We'll just be using both. Now some of you have asked if we'll be posting the same things to APN that we post to Twitter. Yes, of course. If you're worried about that seeming duplicative, you shouldn't be. A long time ago I asked one of the smartest and best teachers I've ever met how he got to be so smart and so good at teaching. He replied that he went back and took the same classes again and again, multiple times. I asked him why, since that seemed not only redundant but boring. He said it was because each class had different people in it, and that meant different questions were asked, and that meant different answers were given. He derived so much better, broader understanding of his subject matter by listening to different people ask different questions, that he ended up very literally lapping all of his peers. I follow pretty much the same people on ADN as I do on Twitter and some of them post the same things on ADN as they do on Twitter, and that doesn't bother me at all. Because, despite that, it's different. Social is a complex system that depends a lot on conditions over time -- who sees and replies/repots what, when -- that two almost identical stones (posts) thrown into two almost identical rivers (timelines) still produce remarkably different ripples (conversations). This might annoy some people, more precisely those who believe each network should be kept pristinely unique, but as any good ZEN and TECH viewer knows, expectations aren't obligations. No one has the right to tell anyone else how to post on Twitter, ADN, or anywhere else, and if they think they do they should start satiating their corrective compulsions somewhere much closer to home. Post and let post. So, if you use both Twitter and ADN, we encourage you to follow us on both Twitter and ADN. It makes it doubly certain you won't miss anything great, and doubly likely we'll have some great conversations. And we'll keep improving the way iMore pushes to both Twitter and ADN just as much and as frequently if we can. Now bring the conversation, and be sure to leave your username in the comments so @iMore can follow you back!